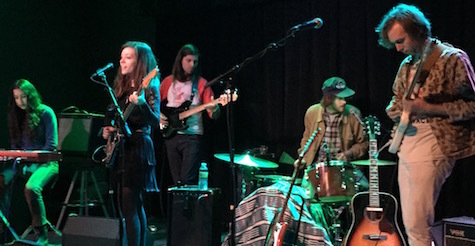 Quilt at Reverb Lounge, March 31, 2016. Last night’s Quilt performance at Reverb Lounge was a gorgeous step back into another time and place: San Francisco circa 1967, or at least what I think it must have been like back then, sans drugs and war and technology and free love. Audibly the band captured that fractured, beautiful era with its own pastoral rock rife with Byrd-ian harmonies, Jeffersonian Airplane guitar and sun-streaked flowers-in-your-hair melodies amped up to modern times with flourishes of pace and rhythm likely absent from the Nixon era. That’s a colorful and long-winded way of saying that Quilt’s performance dripped with even more nostalgia than what’s heard on their sublime new album, Plaza. That record is, without a doubt, destined to become a modern indie rock classic, dense with strings and flute and keyboards along with the band’s sterling performance. But Plaza is more upbeat, modern-sounding and “rocking” than what we got last night, which for the most part, felt a tad subdued and painted in sepia tones. The four-piece recently became a five-piece with the addition of a keyboard player, who gave dimension to the traditional rock arrangements. It’s harmonies that take the sound to the next level. While front-woman/guitarist Anna Rochinski and guitarist/vocalist Shane Butler provided the bulk of the lead vocals, drummer John Andrews’ tight harmonies on almost every song provided glowing nuance. Bass player Keven Lareau also threw in some extra woo-hoo vocals. Andrews got to sing lead on one number, which he dedicated to local hero Simon Joyner. While most of the songs were laid-back, the band got the crowd moving on the night’s closer, “Own Ways,” which also is the album closer on Plaza and my favorite song on the album. Imagine Feelies’ rhythms with spy guitar and CSN&Y harmonies — the perfect highway driving song. Afterward, it was a feeding frenzy for merch back inside the bar (and I think I accidentally screwed the band out of $5 when I bought a vinyl copy of the new album and a T-shirt. I’ll pay you back next time, Team Quilt). 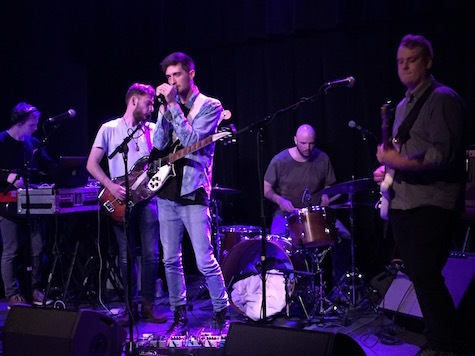 Halfloves at Reverb Lounge, March 31, 2016. What a week of shows. From an indie music standpoint, the weekend lets up on the gas pedal, at least until Sunday night. Tonight’s big show takes place at fabulous O’Leaver’s, where native New Yorker now Omahan MiWi La Lupa celebrates the release of his new album on Team Love Records, Ended Up Making Love, produced by Mike Mogis and Conor Oberst. I would not be surprised if half of Bright Eyes doesn’t make a guest appearance during MiWi’s set. Opening is McCarthy Trenching and Mike Schlesinger. $8. Starts at 9:30. Expect a crowd. Tonight also is the swan song for Bomb Shelter Radio at Milk Run. The art project / guerrilla radio station located in the art room next to Milk Run will be broadcasting tonight’s show live starting at 9 p.m. at 95.5 FM in downtown Omaha and online at http://mixlr.com/bomb-shelter-radio/. Bands will be playing in both the Milk Run and in the Bomb Shelter room. The lineup: No Thanks, Sam Martin, Conchance, Dominique Morgan, Silversphere, Was (members of Gordon, Universe Contest), Rogue Moon, Graham Ulicny, The Shrinks. The show starts at 9 sharp and is $10. Tomorrow night (Saturday) Josh Hoyer & Soul Colossal celebrates the release of their new album, Running from Love, at The Slowdown (no doubt in the big room). Opening is Satchel Grande and Rothsteen. The 8 p.m. show is $8 Adv/$10 DOS. Also Saturday night, O’Leaver’s has Anthems, Low Long Signal and Super Ghost. $5, 9:30 p.m. Finally Sunday night, Lookout Lounge does it again. Indie band Yuck (MAME Records) headlines a show that also includes Saddle Creek Records’ latest signing, Big Thief, making their Omaha debut. Opening is Noah’s Ark Was a Spaceship. I suspect this will be a rather massive show. Better get your tickets now. $12 Adv / $15 DOS. Show starts at 9 p.m.